BBC NEWS | UK | Magazine | Are the old ones the best ones? Are the old ones the best ones? Some of the world's oldest travel guides have been updated for the 21st Century traveller. But how far would a 100-year-old edition get you on today's tourist trail? Tourists were once as wedded to a little red book as they now are to the screens of their camcorders. Stranded in a church in Florence without her Baedeker in EM Forster's A Room with a View, heroine Lucy Honeychurch starts to cry because she has no-one to tell her what was beautiful. When the novel was published in 1908, Baedekers were at the peak of their influence over where and how the middle classes found their tea, culture and lodgings abroad. The first guide was published in 1832, and by the early 20th Century, editions in English, French and German covered virtually all of Europe and as far as Tehran and Mexico City. But the publisher has followed a similar path to many of the doomed empires it has chronicled. The world wars were disastrous for a German company reliant on the free flow of wealthy Europeans, but the books did prove useful to soldiers and airmen. 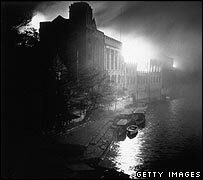 The Baedeker raids of 1942, the bombings of historic English cities, were so-called because the Luftwaffe had supposedly vowed to destroy every British building marked with three stars in the guide. After the chaos of war, the company was re-established in 1948 and has continued ever since, although this week's new guides for the UK market are the first in five years. 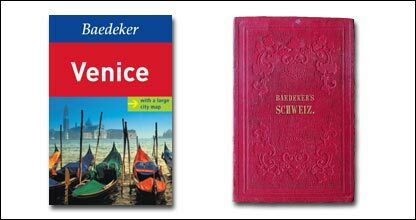 Comparing Baedekers old and new, it is their tone that has changed even more profoundly than the destinations they cover. The emphasis of the new guides is about treading softly. In Egypt, visitors are advised to ask before they take pictures, wear discreet clothing, and not to drink alcohol in public. In Italy, we are told compliments work better than threats. Travellers a century ago were also advised how to keep out of trouble. Don't be rude in Spain, they were advised in 1913, because it serves only to "excite the inflammable passions of the uneducated Spaniard". Unlike many modern tourists in their air-conditioned coaches, they could not simply avoid interactions with the locals, because they were used to having servants at home and wanted similar comforts abroad. Lines had to be clearly drawn. In a Baedeker phrase book from the 1890s, potential servants were greeted with the words: "You must be exact in the execution of my orders, and if you happen to get drunk, I shall dismiss you at once." Similarly stern were the judgements on whole populations. The Italians cared little about dirt, Americans spat too much, while ordinary people were judged on a scale from docile (Egyptians) to uppity (the Spanish). But Baedekers have usually been overwhelmingly full of facts rather than opinions. Baedeker's London gave 32 pages to the National Gallery in 1896, with descriptions of virtually every painting on display. In 2008, it gives only seven, despite larger print. This is why a century-old Baedeker is often a more useful guide than a new one. Such guides were written for travellers who were educated, but lacked the resources or pretensions of those who had gone to Europe a century earlier on the Grand Tour. It is hardly surprising that the new guides have only a fraction of the detail and are full of photographs. But in place of the facts are a few too many cliches, and they lack the cool and knowing feel of Rough Guides or Lonely Planet books. Baedeker's London says Piccadilly Circus is the "hub of the world" for Londoners, yet to many who live in the city it is a complete armpit. With their dutiful reading, and retinues of servants, one might imagine the travellers of a century ago to be more delicate than their modern counterparts. But their Baedekers encouraged them to take risks and live robustly. Ten-day treks by horse or camel needed only careful shopping and a reliable guide, and there are far more warnings about high prices than high mountains. Mexico's 5,600m Mount Orizaba is neatly summed up as "exhausting but not difficult". But this was the age of long, heavy travel. Readers were often advised to take full evening dress, a pith helmet and a medicine chest as well as a large number of suits and dresses. Although Baedekers would sometimes cover in detail the living conditions of those considered exotic, labour was considered cheap, dispensable and not really worth worrying about. The new guides in contrast give lengthy coverage to inequalities, education and health. The difference in attitude is summed up by how the Egypt guides describe the thousands of labourers who built the Suez Canal. The 1929 guide says they were paid "at an inexpensive rate". In the 2008 guide, they are rightly described as being forced labour. Is Piccadilly Circus really the hub of the world? With their prejudices and pedantry, Baedekers were not always appreciated as travelling companions. When Lucy Honeychurch got over the shock of losing her copy, it was a liberating experience. "Instead of acquiring information, she began to be happy." But this only underlines the importance that Baedekers used to have. These days, she might not even have a guidebook to lose. Simon Calder, travel editor of the Independent, says the guide market faces huge problems, as people taking short breaks are more likely to consult the internet than buy a guide. "There may still be a certain amount of loyalty towards the Baedeker name," he says, "but they have been out of the market for a long time and there are plenty of others in their place." Florence without a Baedeker, or any other sort of guide, is now no big deal. Even if we do take a guide on holiday, they seem to have less to tell us, and we have less reason to listen to them. But if you are the kind of person that wants to know about every painting hanging in the gallery, take the oldest Baedeker you can find. I suspect the guidebooks in 25 (never mind 100) years time will be video via an ipod of some sort. I doubt there's much time left for the written word. Hopefully it won't be long until companies like Baedeker and Lonely Planet make their guides avaiable online, and tailorable for a particular region or list of cities. Then travellers could choose the level of detail they require and buy a personalised guide, which they print themselves. Like the record industry, I think that a new business model is due for travel guides, or Wikitravel will eventually emerge as the one-stop shop for travel information. And it will be free. Using the internet instead of a travel guide - I don't think so! How will you find an internet cafe without a travel guide? I've lived in different parts of London since 1980. 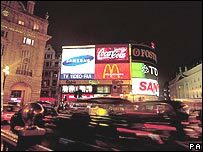 I always regarded Piccadilly Circus as the hub of London. since London is the hub of the world, it must also be the hub of the world. I've never heard anyone refer to it as a complete armpit. The pre-World War II Baedekers are, in my opinion, still the best travel guides ever produced. I have a large collection of them. When visiting foreign cities, however, I always try to take the Blue Guide and the Rough Guide. The former contains invaluable information on monuments and walks around the city, the latter contains equally invaluable information on practicalities and also some very irreverent and amusing comments on sights (the Blue Guides sometimes being a little dry and academic to be really readable). I disagree in 'broad' terms with SC regarding the use of the Internet. Yes, it is very handy and quite excellent for research, but having travelled through South America, bits of Russia and the Baltic, and around Africa, a well written travel guide is indispensible, is available 24 hours a day, doesn't need batteries, doesn't stop working when wet, and if necessary can be used to sit on! If desparate, it has other uses not printable here.